Thousands of young college students in the streets — some tearing down street signs and tipping a news van — were confronted by riot police and pepper spray before being dispersed late Wednesday evening. Another unruly mass of Occupy Wall Street protesters? No, it was Penn State students protesting the firing of a football coach. After charges of sexual abuse by former assistant coach Jerry Sandusky were filed last Saturday, Penn State’s Board of Trustees met Wednesday evening and announced the immediate firing of head football coach Joe Paterno and President Graham Spanier for their complicit knowledge in the alleged sexual abuse. Following the announcement, thousands of students gathered in support of Paterno — endearingly known as JoePa — to protest the administration’s decision. At some point in the evening, the protest turned into a riot — which is sadly not the first at the so-called #1 party school. Admittedly, the student protest-turned-riot does not speak for all of Penn State. As is often the case, the physical damage was inflicted by only a small number of people. Many students, alumni, faculty, and staff are, rather understandably, shocked and dealing with the news in a variety of ways — some extremely positive, like holding a “blue-out” at Saturday’s game to support victims of child abuse. Nevertheless, the events of Wednesday night show a culture rooted in violence, searching for meaning. While the mainstream media has refreshingly got it right about not having pity for JoePa, it is worth noting that the frenzy-hungry news outlets haven’t pounced on the riot to condemn them for what they are: an absurd reflection of society’s obsession with sports as well as a general lack of critical thought and moral coherence among college students. The Christian Science Monitor published a critical news report and the coverage on ESPN has been fair in contextualizing the fallout from JoePa’s firings. But as institutions charged with having a public, moral character — including the media — there should be outright and explicit op-eds and university statements making this a teachable moment about justice, responsibility, and social action. Penn State is charged with teaching young people and “improv[ing] the well being and health of individuals and communities.” The scandal does little to model the kind of moral leadership such a mission demands. Should we really expect more of today’s college students who chose to protest — let alone riot — over the firing of the deified JoePa while neglecting the far graver moral issue of predatory sexual abuse when the institutions themselves are incapable of acting with moral character? The Penn State affair and subsequent riot is like a mirror, revealing to us a more ugly state of affairs: violence is still a valid response to injustice (perceived or otherwise). 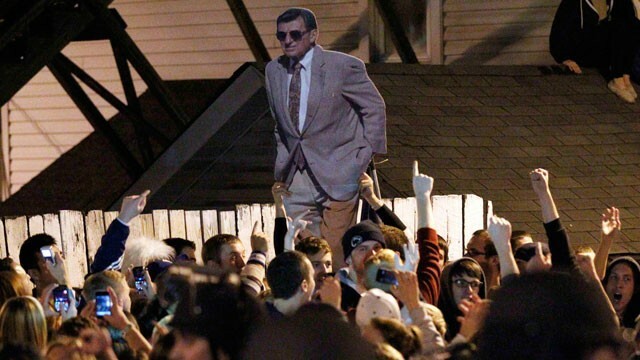 The lack of public condemnation of the student protests is equally troubling, suggesting that the student response was in some way justified; it’s as if we tacitly understand or empathize with the students’ losing their beloved JoePa. There is a sense that people rioted over a ‘stupid apolitical hockey game.’ While I too wish people were motivated by social justice issues, the hockey game is not apolitical by any means. The riots were a fundamentalist defense of a type of nationalism, most evident in the beatings of Bruins fans in Vancouver last night. NHL hockey is not simply a game, it is representative of obedience to consumerism and is part of the state’s attempt to forge a false identity—despite vast differences and inequalities across race, class and gender, through the spectacle of sport. What the Vancouver riot and the Penn State riot have in common is the loss of identity in society. As any Penn Stater or college football fan, for that matter, will tell you, JoePa was God. When he got sacked, there was a vacuum — a search for meaning — at Penn State that needed to be filled. And contrary to all the press nonviolence has been getting of late, modern society is still dominated by the myth of redemptive violence. This myth, posited from imperial creation myths, suggests that violence is inevitable and the way of the world. There are many factors that contribute to a riot, but at the core is a deep-seated, unconscious belief in both the social efficacy and ultimacy of violence. Add into the mix the history and circumstances unique to Penn State: JoePa as the greatest college football coach of all time, a socially-embedded culture of partying and heavy drinking, and a collective identity tied to Penn State football. Combine those things with the generalized postmodern angst that young people face without necessarily being given or taught the skills to cope with such ventures of self-reflexivity and systems of meaning-making and we can better understand what happened at Penn State.